In particular, what are their anxiety dreams — the ones that make them wake up in a cold sweat in the middle of the night? We all have anxiety dreams — often they're about exams we're unprepared for or being onstage and not knowing our lines. These dreams can help us work through problems. "Anxiety is the most common emotion reported during dreams," neuroscientist Robert Strickgold told NPR in 2016. I figured that Winter Olympics athletes — competing in sports that can defy gravity and threaten catastrophe at high speeds on snow and ice — were bound to have some doozies. So I asked a random sampling of U.S. athletes. Anxious, much? Oh, yes. "We all have those dreams where your whole body just turns to molasses. You can't run; you can't do anything," bobsled pilot Nick Cunningham told me. At other times, he said, he has dreamed that "guys won't show up with their speed suits. Or my helmet — I won't have it." The worst one? "You'll get to the top of the track and your [bobsled] runners will be on backwards. Yeah," he said, chuckling, "that one scares you when you wake up! That would just kind of ruin your day!" Forgetting key pieces of equipment emerged as a common theme. In biathlon, a sport that combines cross-country skiing with rifle shooting, Susan Dunklee says she and her teammates share this anxiety dream: "That we show up to the starting line and we're not wearing our rifle. Which is, you know, a moment of extreme stress!" In fact, for Dunklee, that nightmare is grounded in reality: She did once head off to start a race, minus her rifle. "My coach saw me and said, 'Susan, you forgetting something?' " she recalled. In some of Alpine ski racer Tommy Biesemeyer's dreams, anxiety merges with the prospect of physical pain. "I have had some dreams I've woken up in the sweats from," he said, "going off of a jump, and then just drifting in the air and not knowing when you were gonna hit, but you knew you're gonna hit hard. That's a fear of mine, for sure. That can haunt me when I'm sleeping." The flip side of that dream comes from aerial skier Ashley Caldwell, whose sport involves somersaults and twists some 60 feet in the air. Her dream, though, is less anxiety, more fantasy. "I go off the jump and I start flipping and twisting and I just never come down," she told me. "And I just keep flipping and twisting. That's a fun one. You just keep going. I did, like, 17 million backflips in my dream." Caldwell paused to think about that tantalizing vision. Then, she said, "I just wish sometimes that happened to me on the hill and I wouldn't land on my back or my face!" 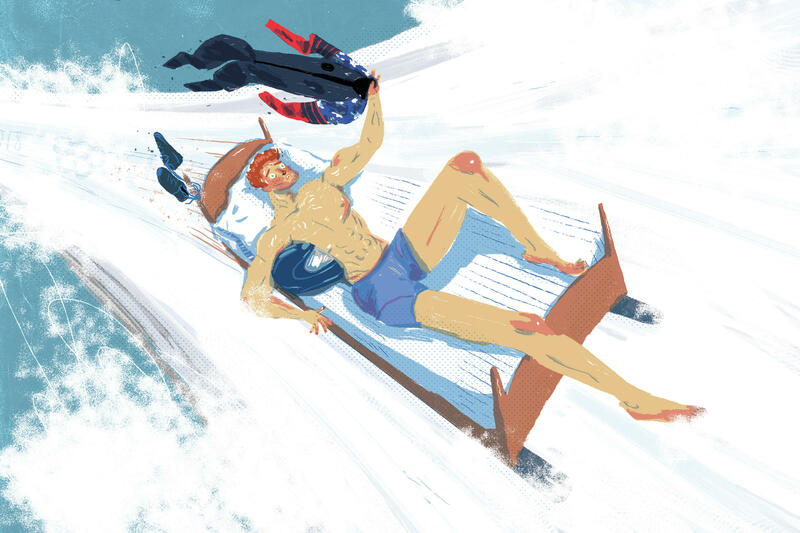 Listen to this story in NPR's Up First Olympics preview podcast.